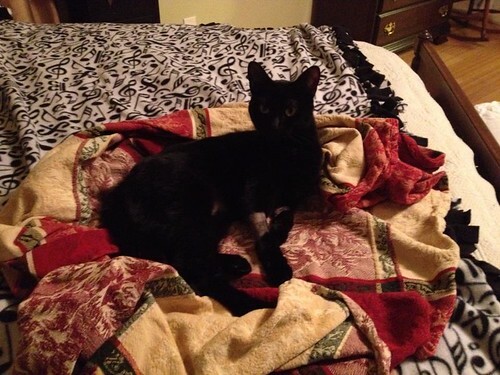 After weeks in and out of the veterinary hospital, Kisha is home again. She still has to get sub-Q fluids twice a day, but she is on the path to recovery. Kisha is a nickname I gave her over a year ago after surviving a severe case of anemia that nearly killed her. Her full name is Karishma - which means miracle in Sanskrit. This little gal has earned that name two times over now. During this latest crisis, I've barely touched my viola. Most of my time has been spent in caring for this little girl. But day by day she is getting better and I'm moving back into my normal routine. Oddly enough, some of my technique has improved despite the lapse in practice, most notably in phrasing and musicality. It may be due in part to seeing death on the doorstep. Who really knows. Either way, I'm happy that my little girl is back home. Technique sometimes grows on its own schedule. She is a beautiful miracle.